All | Nachbarschaftsmuseum e. V.
This entry was posted in All, International cooperations, Migration and Museum on 28. May 2004 by rita. The association Neighbourhood Museum, founded in 1991, operates in the tradition of the “New Museology”. It promotes and initiates projects which deal with historical questions and contemporary problems and which involve cooperation between museums and the local population. It initiated the Berlin project and has contributed to its overall concept. It has set up lines of communication between the museums and migrants and their communities, participated in the activities of the individual museums and co-ordinates for the Berlin museums with the EU-Project. The Museum of European Cultures – Berlin State Museums, which opened in 1999, has as its aim in the identification of European cultural phenomena and their specific ethnic, regional and national aspects, in order to make clear in its exhibitions, publications and events the cultural unity and diversity of Europe. 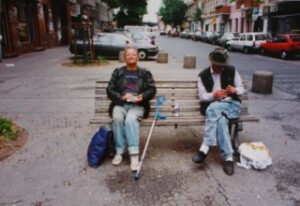 In 2002 it organized the exhibition “Heimat Berlin? 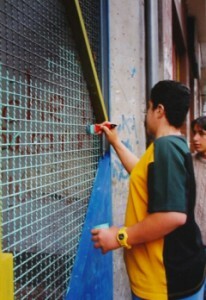 Photographic impressions” and in 2003 the exhibition “Migration(Hi)stories in Berlin”. The German Museum of Technology Berlin is a museum of the cultural history of technology. It presents the different influences on and consequences of technological activity within differing cultural contexts. 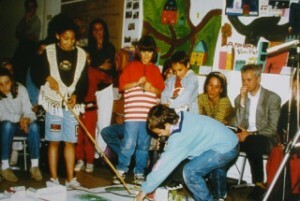 In 2002 and 2003 it organized intercultural workshops and “intercultural open days”. The Berlin Museum Service is an institute attached to the Department of Science and Culture of the Berlin Senate. As a central institute it supports and promotes museum educational activities in Berlin’s public museums. It provided a basis and realised some of the activities of the project. The Berlin Platform has been set up by the above named four museums’ institutions as a part of the European Project “Migration, work and identity”. It has as its goal the long-term establishment of the EU-project in Berlin. It aims above all to promote understanding and tolerance between the various groups of different cultural origin in Berlin through the communication of information about the historical background of the migrant groups. The aim of the Berlin partners is to motivate migrants to collaborate with the museums on the basis of their cultural heritage. Aspects of their history and their contemporary situation will be represented in the museums to become the basis for a dialogue between different cultures and generations. The long term aim is to attract migrants, their descendants and organizations to visit the museums regularly and to work as active partners. In this context, exchanges with representatives from different cultures took place at the beginning of the project. These contacts were made via cultural establishments, migrant organizations, etc. and institutions from the fields of education, business and labour. The Berlin partners wanted to find out how their interests could be linked to those of the museums and in what way cooperation could be established. This formed the basis and a framework for further cooperation, providing important input to the concept of two exhibitions and accompanying activities in the Museum of European Cultures and intercultural workshops / “open days” in the German Technical Museum in the years 2002 and 2003. 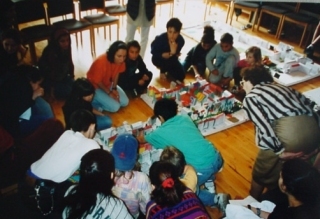 Two workshops for museums specialists were held at Berlin in 2001 and 2002, to find further partners and to disseminate the ideas of the project and the lessons learnt so far. The exhibition “Heimat Berlin? 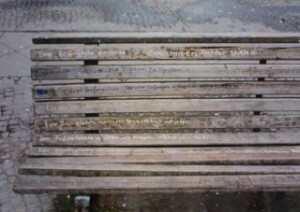 Photographic Impressions” (July – Nov. 2002). For the Museum of European Culture this was the first exhibition dedicated to the theme: “Migration in Berlin”. The photographers, all of differing lands of origin, who live and work in Berlin, were the protagonists of the exhibition. They grappled with the idea of a multi-cultural Berlin, illustrating both its public and private aspects. They chose their subjects from the areas of work, leisure, family and religion, always asking the question: how do we see ourselves and how do we see others. A programme of events accompanied the exhibition: guided tours of the exhibition by the photographers and discussion evenings with them, where they talked about their view of life in Berlin and what they themselves had experienced in the city and showed further examples of their work. Readings by non-German authors and a multi-cultural “Berlin Breakfast” also took place in the museum. Berlin is a “cultural patchwork”. Migrants have always decisively shaped the face of the city. The exhibition shows why and how they manage(d) this through eight objects and their contexts. These are expressions of the migration processes in Berlin from the last third of the 19th century to the present. The digital work by Cida de Aragon, entitled “Migration is a creative situation” serves as an atmospheric introduction. Next to aspects of the history of migration, histories of the central objects have also been displayed. Last but not least, the biographical details of the people associated with these objects are included as is an audio presentation. A programme of events accompanies the exhibition: storytelling by migrants of the “first generation of guest workers”, presentations of the work of migrant organizations, readings by authors from different cultures about the Berlin they live in, a Russian-Brazilian discotheque, guided tours through the exhibition and talks to school classes by first generation guest workers, the organization of an intercultural day, guided tours through the exhibition and talks to school classes by first generation guest workers. At an “Intercultural Day” seventeen migrant organisations presented their work, ideas and initiatives and discussed these with Berlins Ombudsman for Integration and Migrants and with the initiators of the Berlin Platform. Last but not least: an intercultural family day at the museum with guided tours through the exhibition, accompanied by readings. Within the project the German Museum of Technology has concentrated on the aspects of Work and Identity. It asked the question as to how far the museum can become a place of identification and value for migrants. Answers were discussed in several workshops and at two public events. Migrant organizations and those that have worked with migrants for many years provided the groups of visitors. With their help, meetings were held and the public events organized. The first aim of the workshops was to introduce the museum to Berliners of the 1st to the 3rd generation above all from Turkey but also from other lands of origin. They were encouraged to spend time closely examining individual technical exhibits. The guided tours offered the opportunity to discuss the technological and cultural history of their lands of origin and to compare this with the museums presentation of a predominately European view of the development of Technology. It became clear that technical exhibits by reason of their relationship to everyday life were particularly useful in determining and discussing differences and communality in the use of technology, both within cultural traditions and as personal experience. The participants talked about their personal connection to various objects, through their work either in their land of origin or in Berlin. Having lived and worked in Germany for many years, the participants were able to consider the museums presentation of the technological history of Berlin as part of their own history. The idea emerged from the workshops for participants from Turkey to become guides not only for their own community but also for all other visitors. An intercultural weekend in the German Museum of Technology on 5th and 6th October 2002 provided an opportunity for this. To integrate the new guides, teams were set up with them and with the regular museum guides, who worked together on this weekend to inform visitors. For the museum this cooperation led to a new quality of service for the visitors. Through the direct discussion about technical objects, it was even possible to overcome language barriers. 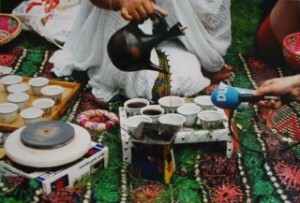 The objects were the occasion for communication: people began to talk to one another about themselves and their cultures. 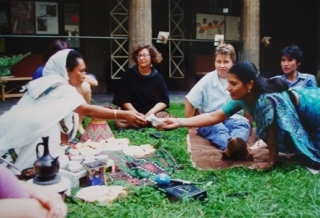 This type of event was repeated during the International Day of Museums on May 18th 2003, which had as its motto: “Cultural contacts, intercultural encounters in the Museum of Technology”. The teams of guides were extended to include people from other lands of origin. Together they chose individual technical exhibits to present to visitors. By comparing European machines and handicraft techniques from Turkey, Jordan and the Ivory Coast, there developed fascinating points of contact and informative discussions both for the guides and for visitors. These events initiated an exchange between different cultures in which more than 5000 visitors took part  and showed that an intercultural exchange and a discussion about differing forms of technology could be very successfully combined. The participants talked about an increase in self-confidence through their work as guides. And those who had never before visited the Museum of Technology have started to publicize its work within their community, a role which they can imagine continuing to fulfil. The cooperation has led to a new quality of service for visitors and a new set of visitors. All those involved are hopeful that this will become the norm for the future of the museum. This entry was posted in All, International cooperations, Youth projects on 26. June 1991 by rita. Stories of the elder on their childhood memories inspire young students to explore their quarter and look for possibilities to create. 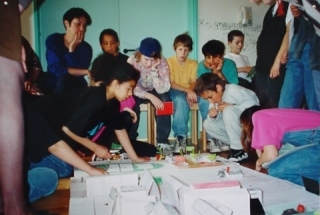 Suggestions for change are incorporated into the model Planning for Real and presented during the neighborhood conference City Space is Living Space for Children.